Tessenderlo, Belgium, 6th November 2018 – Melexis, a global microelectronics engineering company, has announced two new current sense ICs based upon their 20+ years of experience in Hall-effect technology. 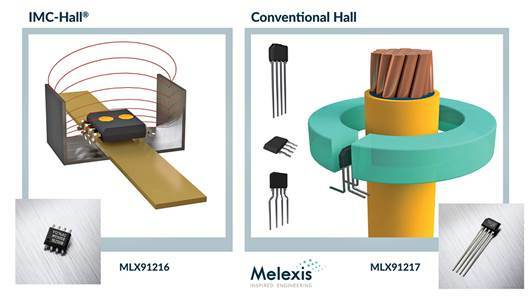 Both of the new sensors share the same high-performance CMOS core and the MLX91217 implements conventional Hall technology, while the MLX91216 uses Melexis’ proprietary Integrated Magneto Concentrator (IMC). A slim VA (SIP-4) package houses the MLX91217, allowing for integration into conventional Hall-effect measuring rings. The compact pin-thru package is available with various lead trim and form options, making it compatible with SMD technology PCBs. The MLX91216 is housed in a conventional SOIC8 package for SMD placement. Its IMC technology simplifies the current measurement requiring no external ferromagnetic concentrator ring, making assembly easier as well as reducing size, weight and cost. Both devices are AEC-Q100 Grade 0 qualified for automotive applications and operate over the temperature range -40°C to +150°C.